As you can see in this photo of Garry pointing the Milky Way out to me, when you get someplace truly dark and look up at night, it’s pretty obvious where the Milky Way is!! Well, it’s not this obvious to the human eye, but it IS obvious… and even more so with a long exposure such as this. Since then, I’ve been hooked on night photography, especially photographs of the Milky Way above something interesting in the foreground. I’ve wanted for several years now to get up to Crater Lake National Park in southern Oregon to photograph the Milky Way over that gorgeous, reflective lake… and a week ago I finally had that chance! 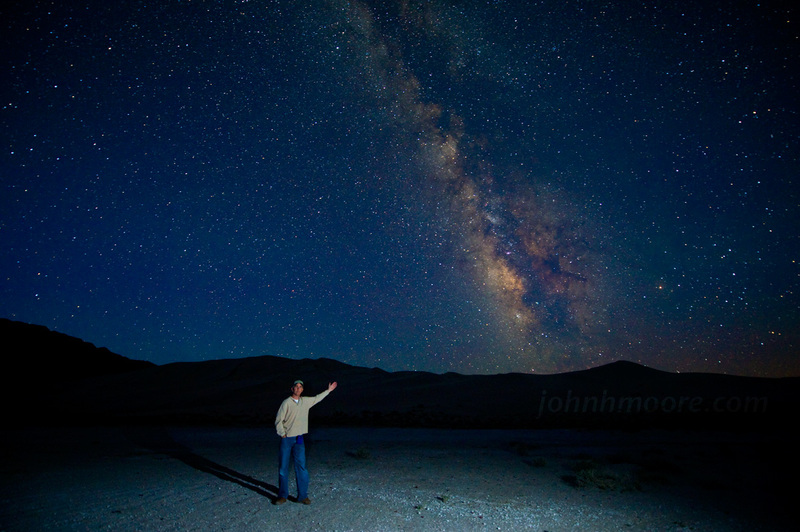 I got to spend two days up there, with two gorgeous, clear skies, dark skies nights out shooting half the night each. I would shoot until 2-3 AM, grab a couple hours sleep on an inflatable bed in the back of my rental minivan, and then be up again by 5:15 or so when the sky was significantly lightening towards sunrise. The first night the sky was especially beautiful, as we were blessed with “airglow” in addition to the stars and Milky Way. Airglow is some kind of chemical reaction high in the atmosphere that creates the green streaks that you see in the sky here below the Milky Way. 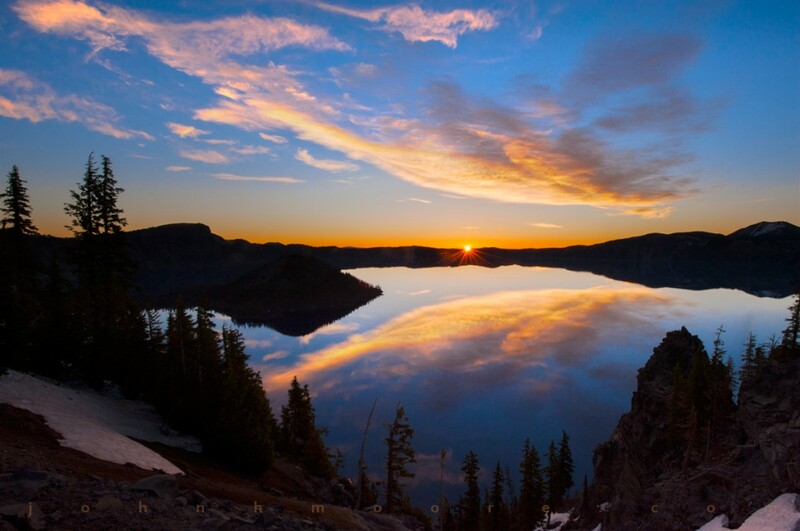 The second sunrise was also especially beautiful, with a fabulous swoosh of clouds reflected in the lake and the sun peaking over the caldera rim opposite. I’ve only just begun to process photos from this trip, so… more to come! This entry was posted on June 18, 2013. It was filed under Uncategorized. This is truly amazing!! You have a gift! What kind of camera and lens did you use to take this wonderful photo of the mikyway? I am just getting into night photography. Am with Russell. What lens and what were your settings. It’s amazing. Such beauty. Such amazing work. Whoa. Floored. Great shots. I wonder, did you use the iOS app titled “PhotoPills”? The developers just added a Milky Way tool set that lets you turn it on and off while choosing where you are standing on planet earth…really cool. I just have to get to a position where it will be dark (as you said) and will be positioned in just the way I want it to appear. It’s not an any night opportunity, you really have to plan for it as I’m sure you did here. luv ur milky way airglow…luv to learn how to photo like that….